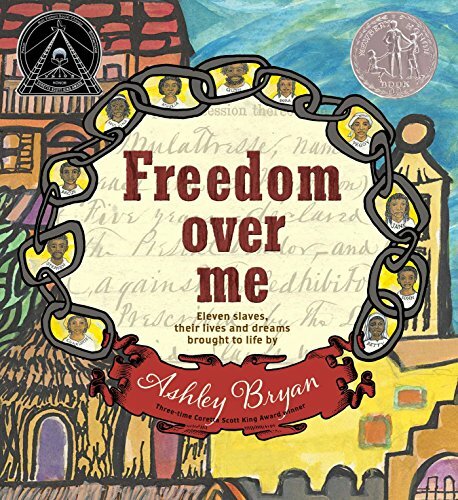 Many years ago, author and illustrator Ashley Bryan came into possession of an “Appraisement of the Estate” document involving 11 slaves, some cattle, and some cotton that were about to be put up for sale after a plantation owner died and left his widow to maintain his estate. Because the widow did not feel she could manage the estate alone, and because she had heard of slave insurrections in other parts of the country, she decided to price her “possessions” and then return to her native England. Bryan felt compelled to tell these slaves’ stories. However, as happened with most slaves, most of the personal details were left off the appraisement. There were no faces to match with names; no ages to work from. All Bryan had was his connection to their stories and the whispers of ghosts from the past. But sparse though his documentation was, Bryan was still able to masterfully weave the tale of the 11 slaves whose fates were entangled with the laws of the day and a widow’s desire to leave the past behind and return to her country. Bryan began the important undertaking of telling their stories by first creating painted portraits of each slave. Then he looked at what he had created and “listened for their voices . . . writing what I heard in free verse to give emphasis to their words.” From there, he dedicated an accompanying page to their inner thoughts, their dreams of their past lives in Africa (if they could remember), and their hopes for the future. This is a powerful and moving book about talents and dreams and the injustice of “pricing” and “owning” fellow human beings. The prose is plain, straightforward, and so authentic that readers will feel they are actually hearing the slaves speak their minds. The artwork has a rough and rustic look, a perfect depiction for the “not-soft” life the slaves must have lived. Use this book during discussions about citizenship, occupations, slavery, gifts, and talents, and the undying desire to live completely free.